Shaine Mata Blog: 2016 Redesign of MissionTexas.net . . . and life? One theme that has been coming up in my life a lot, recently, is letting go of the cruft of life. This includes several aspects, the stuff that clutters up my house, financial accounts that are relics, old ideas that are not yielding their promise, and even relationships (or lack thereof). This has been the case with my MissionTexas.net website. It originally began as just a blog. But, it seemed inadequate at the time to serve as a website. Blogger had not offered Pages at the time. Google did, however, have Sites, which was based on a Wiki. I could use Sites for my concept. It was easy to use and had Adsense gadgets I could use to monetize. I do like Google Sites for its ease of use and because it tracks cross-links. If I move a page, all the URLs get updated. However, Google Sites killed the Adsense gadgets, which means that my theme is somewhat stuck. That's the problem with Google Sites. The service has not evolved with design standards. The last big update was responsive design that makes mobile use easier; but, it's a bit wonky. So, I hesitated to go out and sell advertising because I could not make the site look appealing, nor could I make the site good enough for mobile traffic. 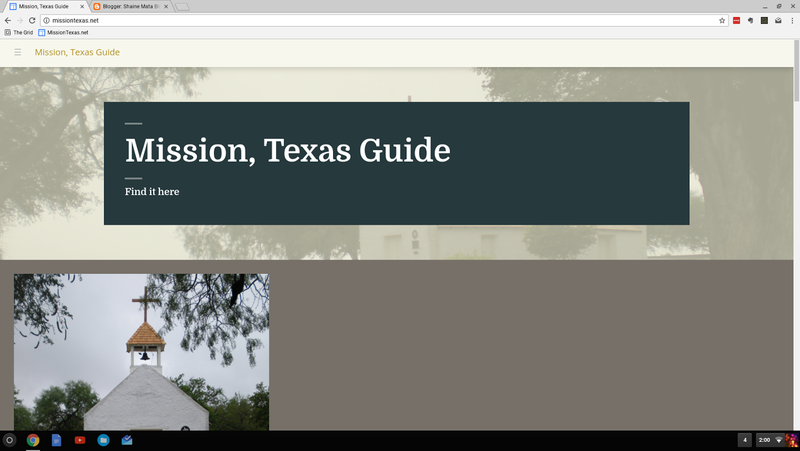 You can view the old site at https://sites.google.com/a/missiontexas.net/public/ for now. Its days are numbered. I had set up the domain through Google Apps, which I later discovered can host multiple domains. So, I'm eventually going to shut that down and consolidate. As a business, MissionTexas.net has generated a little income. Google has paid me here and there for the ads on the site, which I will lose. In retrospect, it was silly to hesitate to move the site elsewhere. It's not like the income has been life-changing. Still, it was the most lucrative of my sites despite the ugliness and lack of updates. I am in the process of moving the content over to a new hosting service that offers more visual appeal for my work. Once the site is fleshed out more, I intend to start looking for advertisers, which will make up for losing Adsense revenue. Still, I'm not completely out of Google. I have decided to keep the MissionTexas.net Blog on Blogger because it serves a different purpose. The blog is geared towards interaction, whereas the site is not. Because of chronology, the blog has somewhat disposable information. Once the news is past, it is past. That brings me to consider, what about ShaineMata.net and ShaineMata.com? The reason I have the two domains is also an issue of legacy. I have not quite decided to stop using Blogger and make a clean start. I do not have to delete my old blog if I do start over. So what is keeping me from doing it? It may turn out to be nothing. Like many things in life, it may just be momentum that keeps me on the same track, not an intention to keep going in the current direction. All it takes is a decision to change course. We complicate something so simple as a choice with countless justifications for not choosing. If only we spent as much energy making decisions as we do making excuses, our lives might have totally different results.